Normally, the Salvation Army overlooking Lake Dot is a quiet nook, just west of I-4 and north of Parramore. But every third Thursday of the month, local nonprofit IDignity transforms the sleepy corner into a lively support center, serving about 200 hundred people who line up for the one thing that could help them the most: legal identification. 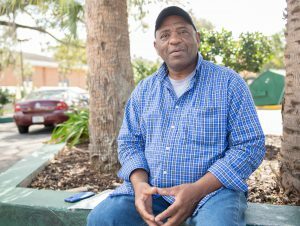 For many of us, getting an ID is a mundane part of life, but for the people who have come to the monthly “identification clinic” – around half of whom are struggling with homelessness, 85 percent with unemployment, and nearly all with the challenges of life below the poverty line – it’s a service that could get them to the next step. It’s a service that Michael Dippy, a Valencia College graduate from the class of ’89, first realized was necessary more than a decade ago. In 2008, Dippy and members from five churches in downtown Orlando banded together to found the nonprofit IDignity, after witnessing the compound problems people encounter simply for not possessing any formal identification. “You can’t get a bank account, a job, an apartment without the proper identification,” Dippy says while giving a tour of the bustling ID clinic. Since IDignity’s inception, more than 20,000 clients have been served. In 2020, the REAL ID Act – a law setting minimum federal standards for acquiring an ID, which was passed in response the terrorist attacks of 9/11 – is set to take effect in all 50 states. As the rules of personal identification will become even more stringent, the work of IDignity has never been more crucial. For many attending the ID clinics, circumstance has placed them in legal documentation limbo, and simply taking a number at a local DMV is not an option if they cannot prove who they say they are. “They’ve been caught in this Catch-22. They can’t get a state ID without a birth certificate. And they can’t get a birth certificate without a state ID,” explains Dippy. That problem feeds into a vicious cycle. Without legal proof of citizenship, people who are already struggling are unable to seek the proper social services, apply for work or even gain access to shelters. They are referred by institutions such as hospitals, shelters and various arms of the justice system in Orange, Osceola, Seminole and Volusia counties to IDignity identification clinics, where a small army of more than 100 volunteers scurry around the premises getting clients the documents, signatures and proof of identity needed to get back on track. Volunteers from various professions including judges, lawyers, restaurateurs, educators and financial advisors donate their time to ensure that clients are REAL ID compliant, often helping them acquire an official copy of a long-lost birth certificate or Social Security card. For Phillip Henry, who is chairman of the board at IDignity, identification clinics are an efficient, but welcoming environment – the kind that struggling clients may not encounter on a daily basis. In addition to volunteers at the identification clinics, the nonprofit brings together representatives from various local government agencies to set up booths to streamline and expedite the paperwork process. Many of the clients walk away with an ID the day of the clinic. But for some – many who were not born in Florida – the process can get even more convoluted. Not only do employees and volunteers at IDignity need to know procedures in Florida – the first state to adopt the REAL ID act in 2010 – they need to be able to jump through the hoops of other states, many of which have different rules when it comes to acquiring that all-important birth certificate. With identification representing such fundamental importance to the fabric of society, it may come as a shock that more than half of those referred to IDignity have been without ID for more than a year. Some have battled addiction, some are veterans struggling to re-enter society, some have had trouble joining the formal labor force, others are unable to find steady housing – and, too often, clients are fleeing domestic violence or other dangerous situations where their documents are being kept from them. Kelly Campbell, 62, sits outside The Salvation Army on W. Colonial after receiving his new ID through an IDignity “identification clinic” on Feb. 21, 2019. Kelly Campbell, 62, is a veteran who fell on hard times in 2018. The arduous journey to pick up the pieces and return to normalcy recently led him to an identification clinic which provided him with a little more than a state ID. “Getting that ID almost felt like when I first got my learner’s permit,” Campbell says with a smile. A battle with drug addiction had left him without a steady job, housing and, most fundamentally, identification. For Dippy, the service of providing clients with an ID – that first step toward self-reliance – is reminiscent of the old adage: Give a man a fish, and you feed him for a day. Teach a man to fish, and you feed him for a lifetime.